Amazon Echo Sub review | What Hi-Fi? Amazon’s decision to name its first subwoofer the Echo Sub, and not the Rumble In The Jungle, is an open goal so woefully missed that sadly, upon our publishing of this review, someone is likely to lose their job. However, the same fate is unlikely to befall the company’s engineers. The Echo Sub confirms Amazon's latest range of products have successfully raised the audio bar. 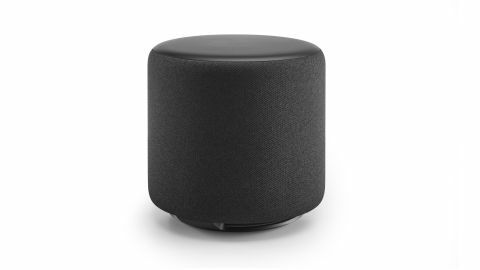 Paired with the second generation of either the Echo or Echo Plus speakers – one or two of them, depending on your appetite for stereo imaging – this gurgling footstool adds considerable weight to the presentation with an output reaching as low as 30Hz. Wrapped in charcoal fabric to complement the aesthetic of those latest Echo speakers, the Echo Sub has a four-litre closed chamber housing a down-firing 15cm woofer and 100W of Class D amplification. Relinquishing all other control than bass response to its paired speaker or speakers, there’s little ornamentation on the Amazon Sub itself, save for a power input and pairing button on the back. At 20cm tall and 21cm wide, it’s like a swollen, featureless LEGO head. You’ll of course need the Alexa app to get the Echo Sub onto your home network, after which a handy video will play on your device to help with your subsequent use. Creating a 1.1 or 2.1 system is simple; take care selecting the correct speaker for right and left channels if playing in stereo, however, else you won’t hear a proper soundstage. Partnering the Echo Sub with our first Echo Plus, we are impressed by how well the pair is integrated. This isn’t a mere hack job, dialling in low frequencies and hoping for the best; the presentation is well rounded and tonally pretty well balanced. More impressive, however, is the Sub’s performance as part of a 2.1 system. The Echo Plus is a fine musical performer by itself, but cannot produce the kind of scale heard here. The addition of stereo imaging and low frequencies stretches the dimensions in all directions, and adds significant power without the Sub being overzealous with its bass. A wireless three-piece, especially at this kind of price, is unlikely to trouble traditional hi-fi class-leaders, but this composition is far beyond the capabilities we may have expected of Amazon only a few months ago. It isn’t perfect, of course. The Echo Sub does drop a star for a slight tubbiness, lacking the clarity and definition of its co-stars. It remains a worthy companion for those who want the full range of Alexa’s abilities with a brawnier sound than the Echo Plus can afford, but its relative corpulence does stick out a little to our ears. But better-performing alternatives to this kind of set-up are limited, and not like-for-like. You could add an Echo Dot to a budget amplifier and speakers, perhaps, or get a weighty wireless performance from a class-leading speaker such as Audio Pro’s Addon C10 but without such wide dispersion. If you already own an Echo product and you want it to gain a little weight in the low end, this is an ideal addition. While the Echo Sub isn’t faultless, we’re confident it represents a worthwhile addition to your Amazon audio set-up.